This is a new competition. You battle for territory. Each level is territory. 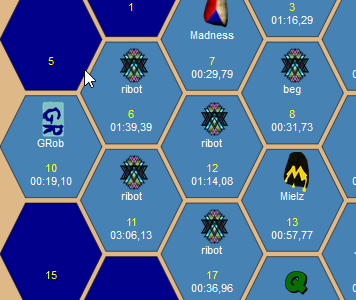 Get the best time on a level to take over the territory. - be a God and change the levels of the map! It will all start with a battle. At that time the website will be released. April 1st 2018, around 19:00 CET. Last edited by ribot on 1 Apr 2018, 19:21, edited 4 times in total. - steal territory from other kuskis just get best time in a level? - surround territory to dominate other kuskis how does this work? - be a God and change the levels of the map! how does this work? Basically you need to directly surround a tile fully. 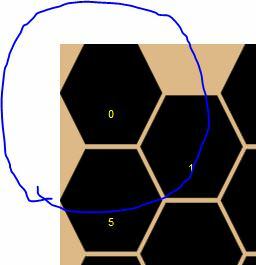 If you have all the territories on this blue line, you have surrounded tile 6, and you then own tile 6 even if you don't have the best time. I still don't understand the god part though. What if someone just changes the map back right after i change the map? First they will have to surround the lev, so they have to beat many of your times before they can change the lev. The world of ElmaWars has been opened by AndrY!!! Now that I finally understood the concept and rules fully, I think this is a really nice and refreshing competition. You get to ponder about tactics (like which levs to play, what tiles do you conquer, what levs do you put) and the levs keep changing up. You also get to either showcase your own well-made levs or give attention to other levs you like in a format somewhere between a cup, a battle and a lev pack. I hope this picks off!